After our dinner last night, we took a walk over to the Chippokes State Park (VA) Visitor Center which is right on the river. Unfortunately, there is a lot of rubbish-y growth between the VC and the river, so we couldn’t see much of the gulls and waterbirds we could hear careening around the waterways. The sunset was lovely, and, as we had expected, the bugs came out as the sun went in. 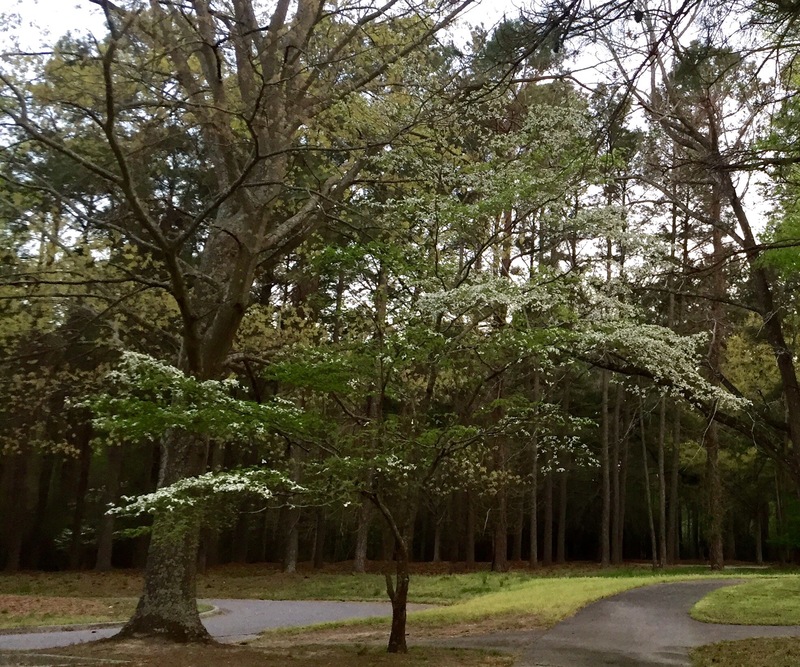 Two photos of some of the wild dogwoods blooming at the Visitors Center at Chippokes Plantation State Park. Having actually gotten chilly in the night (which was a surprise, given we hit the hay with about 65 or so degrees), we arose bundled in sweat-wear, fixed the usual tea and coffee, and ate stone-cut oatmeal for breakfast. That was the perfect start to our first real training ride of the bicycling season. 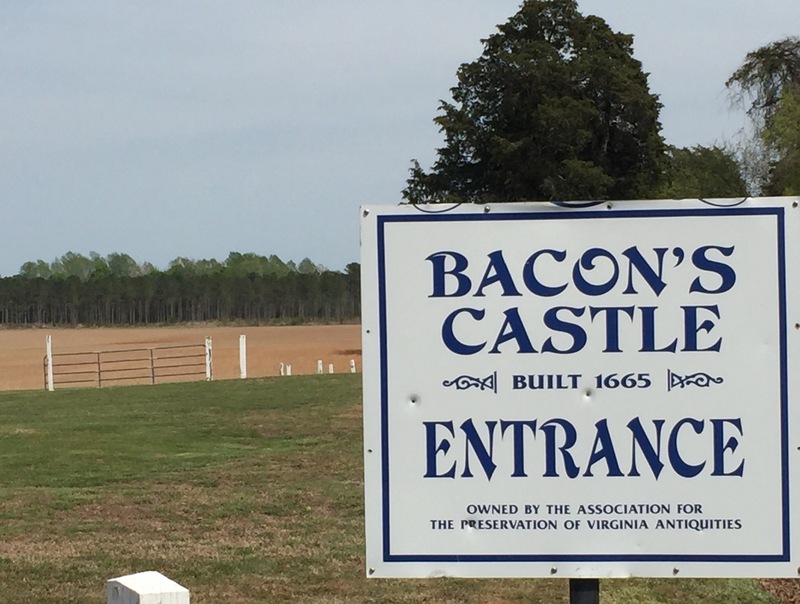 At about 10A we began a mapped “loop” that started at the Chippokes Plantation proper (just up from the campground), and would have taken us to Fort Huger, out a penninsula into the James River, as well as Bacon’s Castle, a local destination hereabouts. 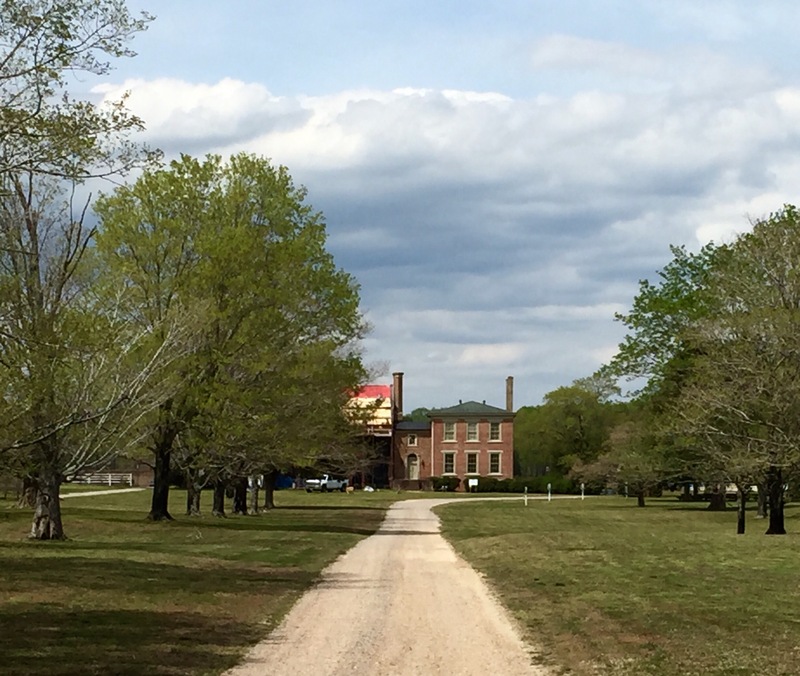 The Fort was built in 1861, but as it turned out, we skipped that out-and-back part of the mapped ride, since it fell around mile 28, and both of us were ready to get off the bikes by then. The weather forecast for the day’s ride had improved—it called for showers later in the day than what the prediction had been, so we were pretty certain we wouldn’t get wet. In addition, the temps were mild and the humidity was waaaay low. So we intended to ride as much of the mapped trail (along back roads, not along a bike trail) as we thought we could manage. Taken all together, if we were going strictly by the map, it would have been a 50-ish mile ride. Neither of us thought we were up to that level for our first day, and there were roads marked on the map to imagine one could shorten the ride and still cover a lot of the opportunities the route presented. Starting at home, the Chippokes Plantation house itself is made of brick, and there were a few guys working on a brick entryway sign or gate or something across the walkway to the house, so we didn’t go into the yard. And from the parking area, you couldn’t see the main building very well. So I didn’t get a photo, even though the gardens surrounding the house looked lovely. We rode a while longer through the flatlands and agricultural areas, which was really pretty and good cycling. Although riding along flat roads is, in the most obvious respect, easier than climbing a lot of hills (which of course, is why we’re here in the first place, to begin training in an “easier” environment), the downside is that you’re sitting on the saddle of the bike without respite when you’re pedaling into the wind through farmland with few windbreaks. But that part of our bicycling needs “training” too, after all. We saw several older homes with four chimneys at the four-square corners of the “typical” two-story, rectangular farmhouse. Several were in seriously deteriorated states, which was sad to see. Other wrecks included a church, and many barns, plus a fairly new home that had obviously experienced a chimney fire recently. We took a wrong turn somewhere (the map didn’t include many route numbers and the geography didn’t include many road names) and headed into Surry by mistake. But that worked out well, as we found Anna’s Italian restaurant in time for lunch. We both had fish filet sandwiches that were quite tasty. Our “detour” cost us 14 miles, since we returned to the junction where we had made the wrong turn and carried on along the route. As we neared the river again (and we saw some of those rain clouds gathering in front of us) we began to really hit the wind. 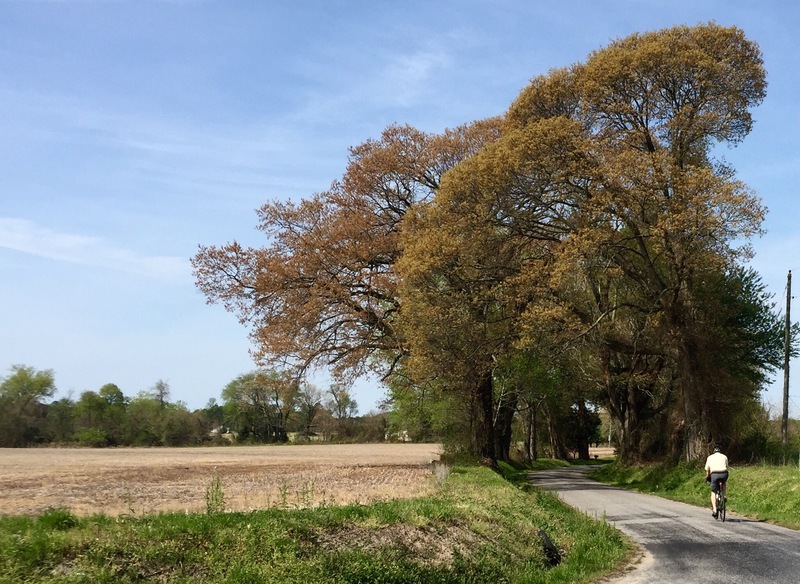 We thought there might be a way to “truncate” the mapped route, shaving off a few miles, but the roads shown on the map were gravel and sand, and each opportunity we might have considered included “private” signs and gates. So we simply carried on as, by this time, we were headed back toward the State Park anyway. But by about mile 28-ish, when we had the opportunity to head out to the river to see Fort Huger, we declined. Bacon’s Castle was also at this end of the loop, and was “on the way” home, so we paused briefly to note that more construction was happening on that structure, too. So again, we did not go in. We did stop long enough to have a small energy boost in the form of a fruit bar. While I’m sorry we did not get out to Ft. Huger, mainly because it was on the water, and we did not see the river all day (nor much in the way of interesting bird life), we were both ready to get back. The weather had held, the wind wasn’t brutal, the sun wasn’t cooking us, and the traffic volume was very low. It was, all things considered, an excellent first day’s training ride. 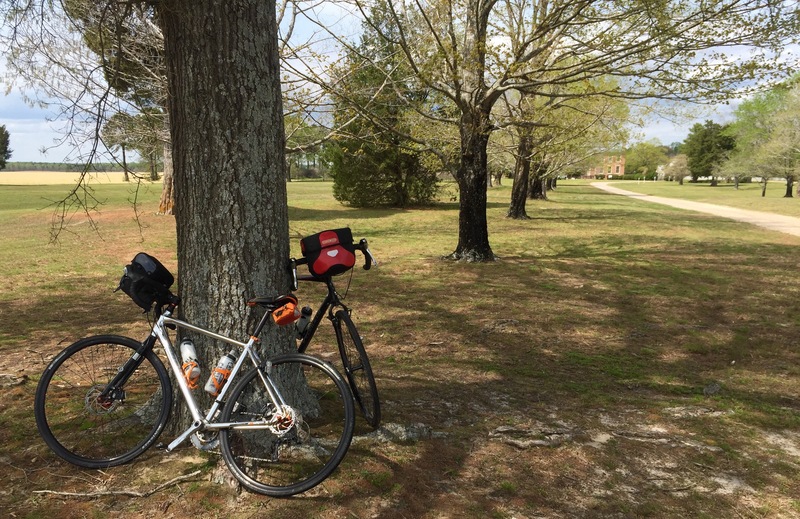 We logged 38 miles in 3 or so hours of riding time, clocking an average of 12.5 miles per hour. Most of our loud neighbors from the night before had left the campground by the time we returned from our ride, and remember those clouds? When we got back to the campsite, they appeared threatening enough that we went ahead and loaded the bikes on the Roomba-rack and covered them with their travel “raincoat.” But by the time we’d both showered, they had all gone away, too. It is slightly overcast as I write this at 5:30P, and the mobs of kids playing with their scooters and bikes and skateboards and etc, right in front of our campsite (which features a nice downhill along the main access road) are gone. 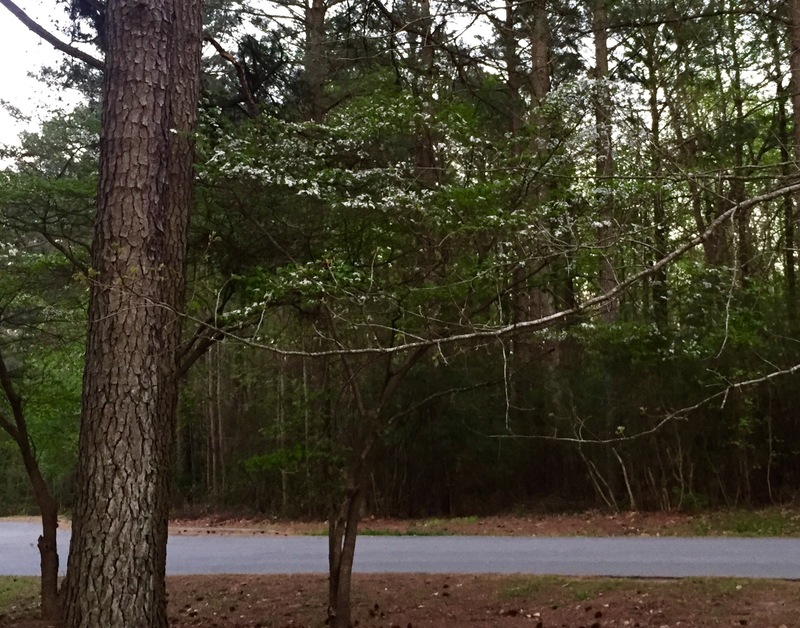 It is cool and a little breezy, so I’m thinking I’ll put on my hoodie and sweat pants again shortly. Dinner will be a leftover game hen that Jack grilled Sunday night at home, plus some frozen tater tots cooked in the Omnia, and a salad. This is definitely my kind of vacation. 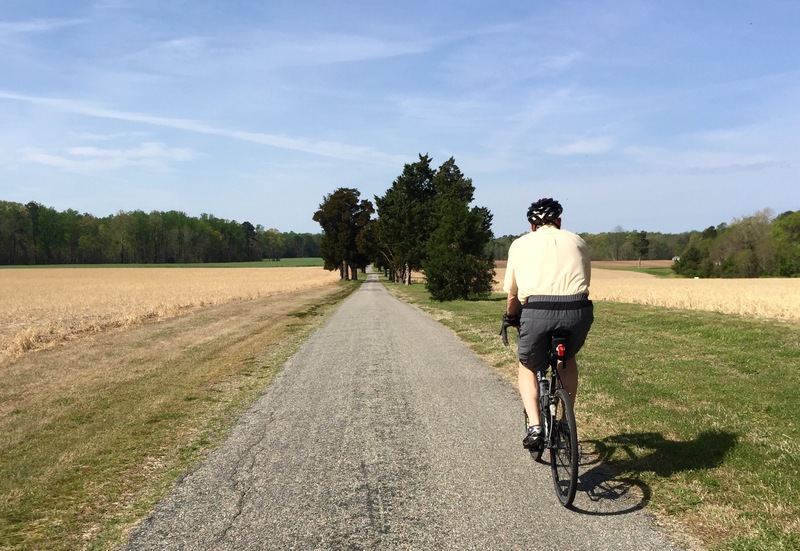 Tomorrow, we head to Janes Island State Park, in Maryland, where we will settle for about a week and ride, and eat fresh seafood, and ride, and sleep . . . Well, you get the idea. More later!